Some live to dream, some live to play… I live to succeed. In my world of Squash. Starting at an age where most of my peers didn’t realize their destinies, I found in myself, an overwhelming desire to show the world what I’m made of... to show them my inner fire, that breathes, burns and compels me to take that extra step and go that extra mile. Being the first Indian to win the prestigious Drysdale Cup at the British Junior Open in 2004 and thereby achieving the distinction of being the top junior player in the world is only one of the many laurels I have brought India, the country of my birth and the inspiration behind my aspirations. Rising in my personal success from Squash player and aspirant to what I am now - a role model to many young players, a cause of pride and envy, I attribute this success to my dream; a dream of becoming the top player, nationwide in Squash. My achievements attain greater importance because of the adversities that I have faced and the knowledge I have gained. Joining the Professional Squash Association in July 2003, I have now attained my best ranking of 29 (Jan 2010). I have also managed to continue my academics at a consistently high level. Becoming world champion will not only help me realize my dream but also go a long way in revolutionizing the sport of squash in India. I want to be remembered as a humble sportsman and role model who broke all barriers to achieve his goal of being world champion. 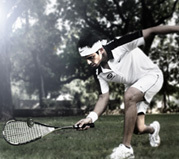 I want to make a difference to the way squash is viewed by the common man in India. I want to make India proud! And I will someday. Why? Because I believe in the power of dreams and the strength of unwavering passion for Sport.